Duff’s wasn’t our only visit in Buffalo, however. After a good round of wings, you find yourself with some fire in the belly (and, if not careful, on ones lips and fingers as well), and I always find it’s good to follow up with some ice cream. Well, Allie’s family is of the same general belief, so when we finished up at Duff’s, they suggested heading a few miles west on Sheridan to check out Anderson’s Custard. 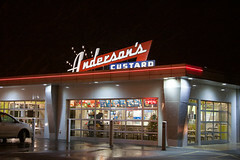 Anderson’s is one of the more prominent Buffalo-area custard chains, with about a dozen locations scattered through the Buffalo area. And they aren’t just a custard joint, they’ve got a full food menu as well, with various sandwiches, fries, and the Buffalo-obligatory beef-on-weck. 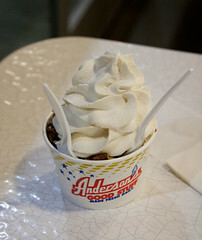 I don’t normally review soft-serve places on Offbeat Eats, but I’ll have to say, Anderson’s has a particularly creamy and delicious custard going on, with a rather pleasant texture. Combine that with the fact that they use real cream, and our Turtle Sundae (with butterscotch, chocolate, and pecans) was a particularly enjoyable dessert, and indeed, one of the best ways to follow up an evening at Duff’s. I’ll have to come back at some point and check out the rest of their menu. A few weeks ago, we stopped at the Anderson’s franchise in Lockport, and got beef on weck. The beef was terrible, full of gristle. I asked the manager if they had changed vendors, and he said that it was a corporate move. I e-mailed the home office, and was told that they would refer my complaint to the Lockport franchisee – still waiting to hear from him. To celebrate Carol’s birthday last month, we took another trip down to Boston to enjoy some more culinary adventures. We started off with a repeat brunch visit to Sofra, where this time I did get the shakshuka, which was excellent). After a pleasant day of sightseeing, coffee drinking (I rather recommend the fairly new dwelltime in Cambridge), and shopping, we ended up in Wellesley, MA at Ming Tsai’s Blue Ginger. I’ll be honest, I’m generally not into the whole celebrity chef scene, since usually by the time a chef becomes a “celebrity”, almost by definition they are spending more time outside their kitchen than in it, and few chefs seem to be able to do that without quality suffering. But we’ve always liked nicely done East-West fusion food, and for a variety of reasons, Ming Tsai’s Blue Ginger has been on our “We should try it out” list, despite the fact that it has rather mixed reviews(on most every review site, and the Boston Globe). Well, we finally had the opportunity, so we figured it would be a good place to celebrate.